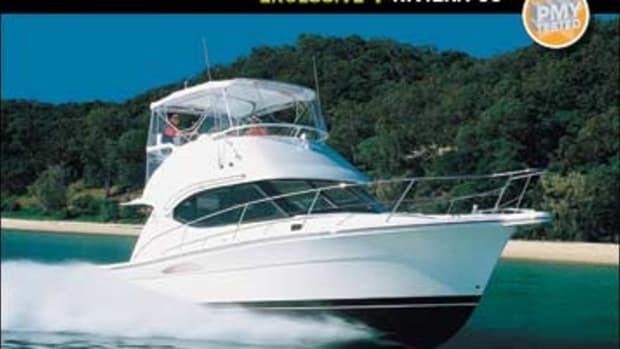 Okay, I&apos;m gonna brazenly reveal my vintage here—I sea trialed the very first Riviera Yacht to arrive in the United States from the Gold Coast of Australia in 1988, back when Supertramp, Billy Ocean, and The Miami Sound Machine were big. 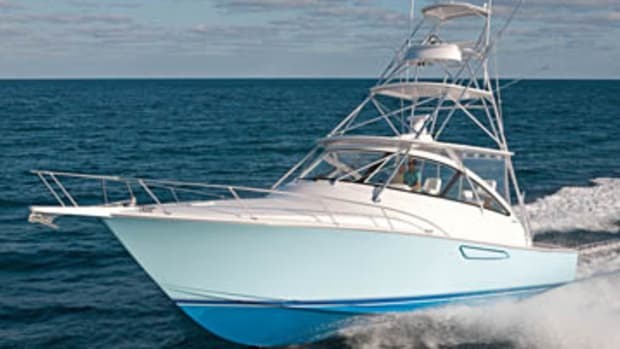 The boat was a 38-foot convertible, a sportfishing cruiser with a roomy and comfortable flying bridge, gutsy fiberglass construction, savvy engineering in her machinery spaces, and lines that were angular, at least by comparison with the Eurostylers that were then just starting to influence the American marine scene. 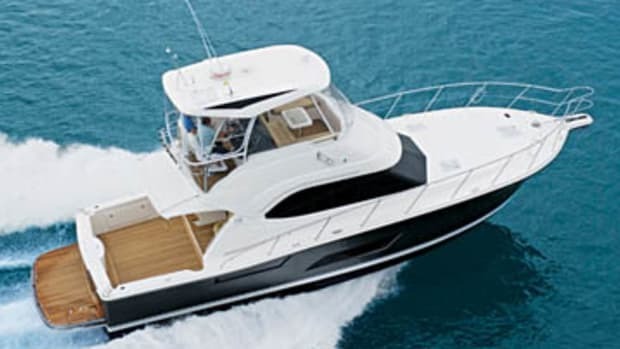 The 38 came to mind recently during a sea trial I did on one of her direct descendents, the new Riviera 56 Open Flybridge Convertible, designed and built in Australia especially for American sportfishing/cruising enthusiasts. Why the stroll down memory lane? From the moment I stepped into her cockpit, the 56 seemed to share a number of basics with her long-lost predecessor. 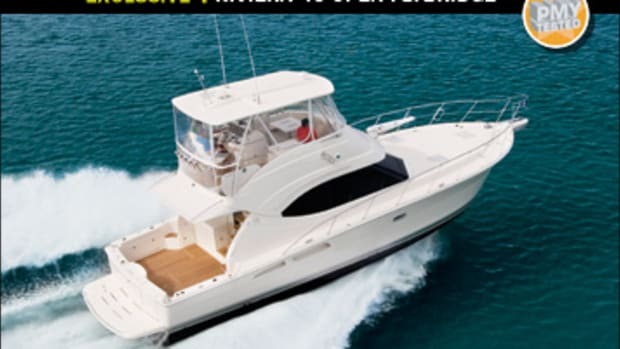 To begin with, she was also a sportfishing cruiser, with a heavier emphasis on fish-fighting perhaps, but more amenities onboard than half the full-fledged midrange cruisers on the market today. Moreover, she offered a flying bridge that was exceptionally roomy and comfortable, an all-&apos;glass construction regime that was gutsy, engineering that was savvy, and, although she came unquestionably close to modern Eurostyle design, a touch of the very same angularity I&apos;d admired years before. But the most dramatic slice of commonality between the two vessels struck me shortly after I&apos;d climbed the aluminum flying bridge ladder and settled in behind the 56&apos;s state-of-the-art, Palm Beach-style helm pod. Yeah, the old 38 had been fun to operate—I remembered her sportscar-like pizazz in open water and how gracefully she&apos;d re-entered her slip in Stamford, Connecticut, at the end of our sea trial. But this new one? Driving her wasn&apos;t just fun, it was flat-out joyous, despite the fact that the wind blew 25 knots for the entirety of our test day, with gusts whoofing considerably higher occasionally. 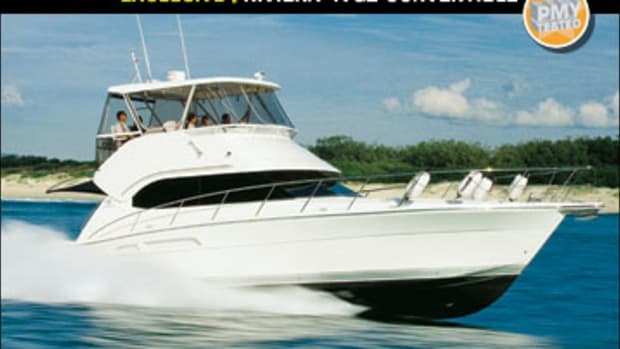 Indeed, although HMY&apos;s slip at Waterway Marina in Stuart, Florida, was tight—with about a foot of clearance on either side—I eased the 56 straight out without so much as sniffing a piling by simply bumping both single-lever, Palm Beach-style engine controls into forward gear simultaneously. 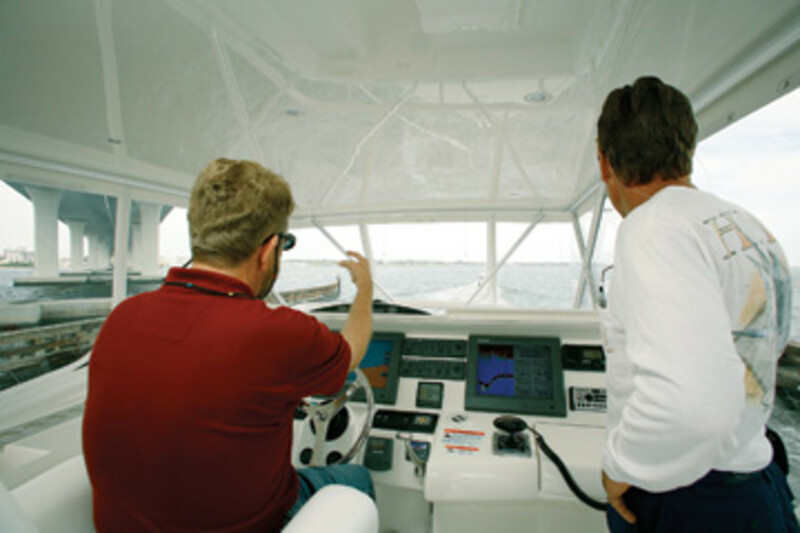 At the mouth of the slip, I used the crosswind to help me twin-screw the boat through a smooth turn to starboard and then headed for a long, straight stretch of the St. Lucie River to do speed and acceleration runs. Tracking at dead idle was steady and arrow-straight. In the river, the average top speed of 46.1 mph I recorded was rather rousing given the fully loaded heft of our test boat and the substantial amount of hardtop-induced wind resistance she had to contend with. The all-American penchant for lounging casually topside proved rousing as well. Five brawny passengers—Aussies and Yanks—sprawled comfortably all over the place while I recorded my measurements. 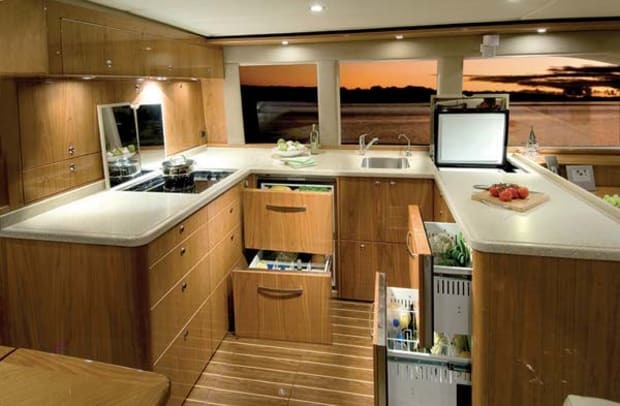 Taking full conversational advantage of the console-type wet bar to port (with drained cooler under the adjoining benchseat) and convertible U-shape dinette/sunlounge to starboard just forward of the steering console, they had a whopping good time. 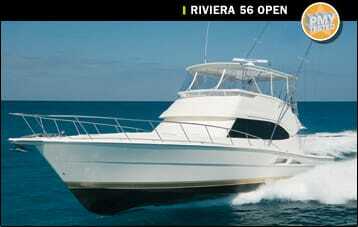 We did the sea trial in the Atlantic after exiting the St. Lucie River through the dicey little inlet of the same name. Offshore conditions were sporty, with four- to six-footers, and a few eights, coming straight out of the east. Negotiating the inlet went smoothly, though, maybe because the tide wasn&apos;t doing anything dramatic, maybe because our 56&apos;s powerplants were so big and torquey, or maybe both. Once we got beyond the end of the channel, I poured the coal to the matched set of 1,550-bhp Caterpillar C30s in the basement, and the games began. Lemme tell you—there&apos;s no denying Dutch naval architect Frank Mulder&apos;s way with a drawing board. Within seconds, the 56&apos;s digital tachs were pushing 1600 rpm (meaning we were doing dang near 30 mph), and I was zooming around the Atlantic like a wild-and-crazy bumble bee spiraling in on a jar of honey, four- to six-footers be darned. The ride was dry, the cornering tight, the down-sea tracking flawless, and thanks to the raised deck under my Pompanette Platinum Series helm chair, the visibility superb all the way around. 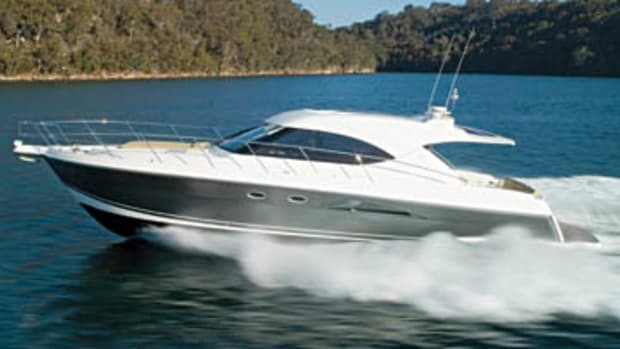 Additionally, the New Age QL trim tabs worked like gangbusters, electrically levering the bow rapidly down in head seas and just as rapidly up for cornering and down-sea runs. Even going astern was a blast! In fact, while thundering backwards into the seas to simulate chasing a trophy fish, our Furuno NavNet GPS plotter registered a velocity of 5 knots, a development that nearly filled the cockpit at one point and prompted the only complaint I&apos;ve got: cockpit drainage seems comparatively slow, most likely because Riviera decided to reduce the size of her scuppers for the American market—something about nixing the chance of losing hooks and other odds and sods. Nix the restriction, I say. There&apos;s one last performance highlight worthy of mention. Upon returning to Waterway Marina, with the 56 poised stern-first at the mouth of her narrow little slip, one of our passengers yelled from the cockpit up to the flying bridge, "Watch out, Bill! There&apos;s a line trailin&apos; in the water off the port piling—favor the starboard side." Although I&apos;d already energized the standard SidePower bow thruster "just in case," the precise oomph of our test boat was such that I never had to use it. A couple of bumps to the gearshifts, and the 56 slid home like greased lighting. Once the Caterpillars were shut down, I came across more examples of niftiness, lots aimed at American anglers. For starters, the three-stateroom, three-head layout was roomy and offered, among other things, gorgeous, precisely joined cherry cabinetry (with a robotically sprayed, high-gloss poly finish), ample shower stalls, even ampler walkaround queen berths (with innerspring mattresses) in both the midship master and VIP forward, and nicely crafted Starion countertops in the heads and U-shape galley. Next up came the schematically laid-out, stand-up engine room. 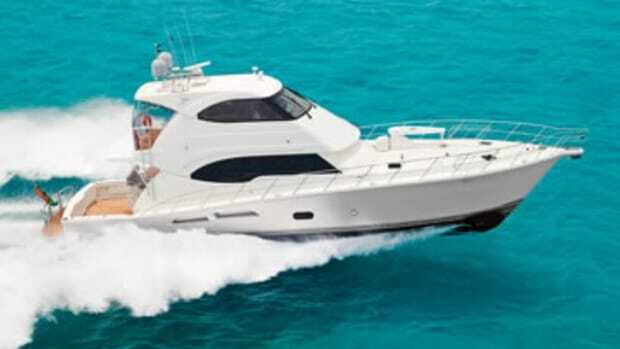 It offered, among other things, easy-to-service, inboard-mounted secondary fuel, oil, and transmission filters on both mains; an elegant, understandable-at-a-glance fuel manifold system; PSS dripless shaft seals; and a Delta T ventilation system with big intake and exhaust fans. And finally there was a fishfighting arsenal that included a huge cockpit with snag-resistant inset hawse cleats, a big, round-cornered baitwell with see-through panel, and a set of space-saving wraparound steps. 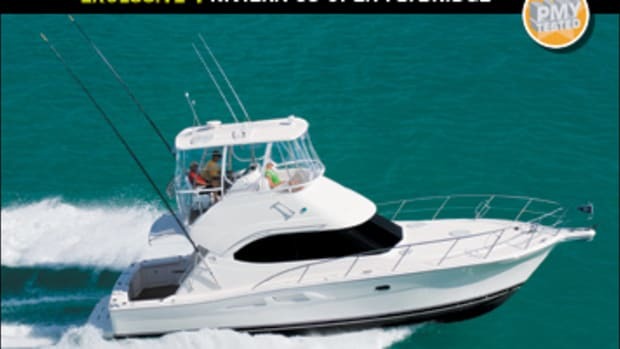 Added conveniences included an electrically activated rod locker in the saloon overhead, a "spotter seat" for watching baits from aloft at the rear of the flying bridge, and a raft of prewiring runs in the hardtop for electronics and other options. As he helped me heft my test gear ashore at the end of the day, I told Riviera&apos;s Chris McCafferty, "This baby reminds me of the first Riviera to hit the states years ago—a 38-footer, I believe." "Hmmm," he replied, in a polite Aussie accent, "Don&apos;t remember that one, Cap&apos;n Bill. Musta been before my time." 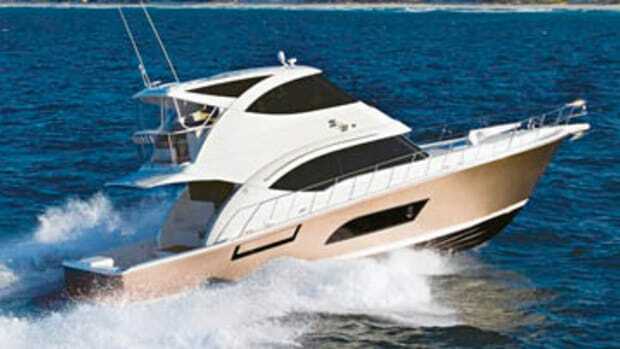 Our 56 was equipped with some nifty trim tabs from QL Marine, a company closely affiliated with Volvo Penta. As you can see from the drawings here, blades or "interceptors" move vertically, generating lift when fast-flowing water encounters them. All parts are reportedly sealed for life, the system is all-electric—no hydraulics involved—and there’s only one hull penetration required, a small hole for a wire run. My take on the system is upbeat. I feel it works faster than hydraulics. Moreover, the tabs automatically retract when you shut down your engines, obviating tab adjustments prior to getting underway again. Plus all components are fabricated from corrosion- and marine-growth-resistant composite material.—B.P.